On Saturday evening, I went to Nandi Hills with Naveen Toppo, his wife (and super bird-spotter) Pinky, and Sharmila Abdulpurkar. Walking along the path near Nehru Nilaya, we found some young men gently nudging something from the middle of the road on to the side, so that it would not be trodden or run over. 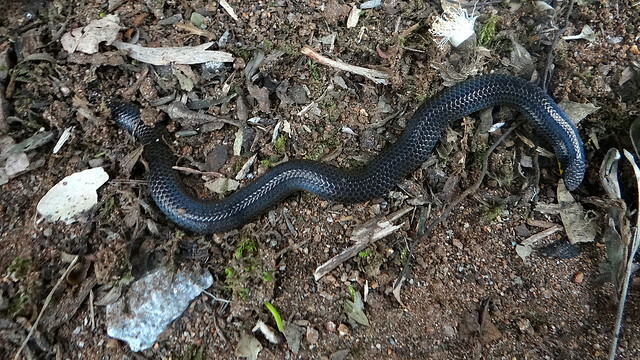 We went to investigate, and I found that it was, indeed, a Shieldtail. The difficult-sounding name, "Uropeltidae" for these serpents is derived from the Greek words, "Uro" (tail) and "Pelte" (shield). This is because these snakes are characterised by the presence of the large keratinous shield at the tip of the tail. These snakes are not venomous. They are supposed to have an exclusive diet of earthworms, but I cannot find anything on the net to substantiate this claim. However, they are reviled by farmers because of their alleged diet...earthworms, with their ability to dig through, and aerate, the soil, are farmer's friends, and any creature that eats them is a farmer's enemy! However, the wiki says they could also feed on other invertebrates (not specified...there can't be too many studies on this. In a way, these are blind snakes, because the eyes are small and dcovered by large polygonal shields. I would like to id this one as the Elliot's Shieldtail, because the Wiki entry says: "They are found in southern India and Sri Lanka. 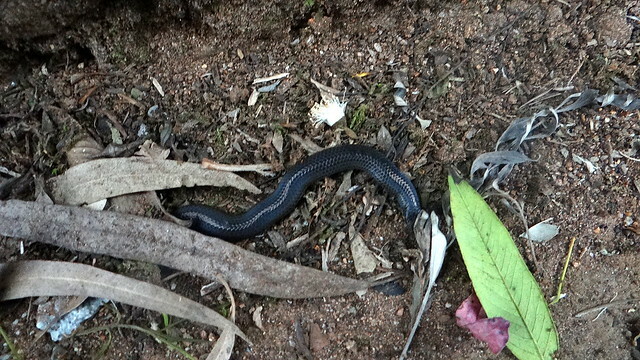 In India, their distribution is mainly along the hills of Western Ghats, and only one species, Elliot's shieldtail, Uropeltis ellioti, has been reported from other areas such as Eastern Ghats and hills of Central India." Ganesh Raghunathan, a friend who was working at B R Hills at the time of my first sighting, told me, "We are seeing quite a few of them here at B.R hills in the past week. they were active and would push their tails hard to prick us when picked up." So I didn't try to touch the snake at all; in any case, it must have been distressed after having been handled by the young men, even though they were trying to help it, and probably did save its life from the passing traffic. Another interesting thing about Shieldtails..they are ovoviviparous....All members of this family retain eggs that hatch within the body of the mother. Whether or not you can pronounce that word fast, this fact is fascinating...a mixture of laying eggs and having the young within the mother's body! We left the Shieldtail to the hills and the rainy evening, and came home, marvelling at the wonderful beings that populate our Earth.